We should visit Pincher Creek at least once a year. 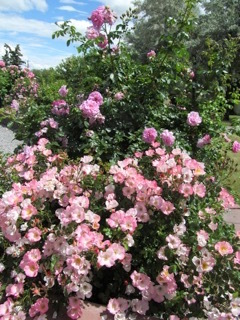 The Oldman Rose Society has created an attractive, interesting and informative rose garden on the grounds of Lebel Mansion. 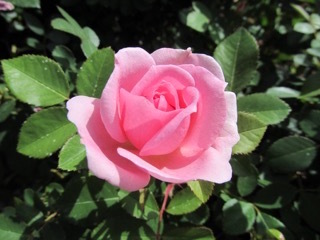 A large circular garden is filled with approximately 30 rose plants, all hardy shrubs that are healthy, well tended, and labeled. There are some old familiar standbys—Therese Bugnet, Hansa and some of the Morden and Explorer series—but the garden also displays a number of unusual varieties. Many of the prettiest have bitone blossoms, similar to the Morden “Sunrise” blend of yellow and peachy pink. One named Water Colours Home Run is a blend of dark pink and yellow; Carefree Delight has single blossoms of soft pink and white; Campfire is bright red/pink with white and yellow. If you are planning to expand your rose bed take a notebook to record the names and qualities of all these lovely roses. As a bonus, the Lebel Mansion is home to the Allied Art Council, and the galleries and gift shop there are also worth visiting. 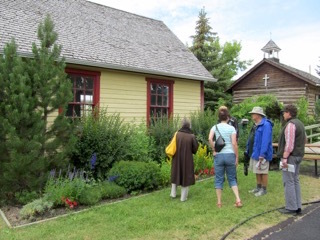 Another attraction in Pincher Creek worthy of a visit is the Kootenai Brown Pioneer Village. This large historical facility boasts two dozen heritage structures and two museum buildings that encourage visitors to relive the western Canadian frontier, circa 1890. Many of the buildings, especially those that had been homes, have flowerbeds around them filled with hardy perennials appropriate for today’s garden, if not completely accurate for the homestead of 1890. On the east end of Pincher Creek, Perfect Posies Greenhouses drew our attention. Although by our July 9 visit, there were not many plants left, we still managed to partially fill the trunk with plants whose sale price we could not resist.